We are at the beginning of our potty training with Gabe. I hate potty training. Really, truly, if I could hire out for this one task, I would. I wish I could snap my fingers and make it happen, so anything to help is welcome. Their timing being perfect, Pull Ups asked me if I would be willing to check out their new Disney Cars themed training pants and their new online features to help with potty training. Gabe is the world’s biggest Cars fan, so of course I said yes. The most fun tool they have is a special phone call you can sign your child up for from either Mater or Cinderella. If you want to check out Gabe’s reaction to the call you can check it out here. Gabe was excited to hear Mater- but then frustrated that there was no video going along with it. I think we will try it out again when Gabe is on the potty. It is basically a cute motivational speech about taking a potty break. If you want to sign your kiddo up for a call, check it out here. They also have cute character pull ups to help encourage your kid- I always tell mine to try to keep Mater and Lightening McQueen dry because they don’t like to have yucky pee on them. The Pull Ups site also has a great kid friendly potty timer and many other fun features. If you’re fighting the potty battle- check it out! For some other great tips and tricks- check this out! The Lazy Chef: Laid Back Cooking For Hot Summer Days! Today I am doing another cooking with Augason Farms post! It has been a hard post to write, not because I can’t put my thoughts together, but because it is summer and I don’t feel like cooking! So I decided to do my post around the theme of not wanting to cook, because I know I can’t be alone in that thought. The only real problem with my not wanting to cook is that I still want to eat. 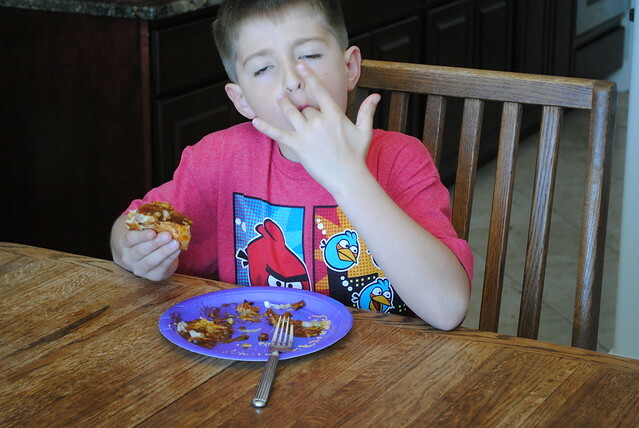 And my children REALLY want to eat, pretty much all of the time. I looked through my pantry at all of my food storage and I tried to find the very most simple, yet satisfying products. I started out with this yummy blueberry muffin mix. My kids can inhale muffins in seconds, and always want more, so I really like how you can make as many or as few muffins as you want with the number ten can mix. Also, this mix is simple enough that my ten year old can make the muffins while I put my feet up in the backyard and enjoy summer. I love that the only ingredient you need is water because it keeps the mess low, and it keeps me from making any last minute trips to the store. 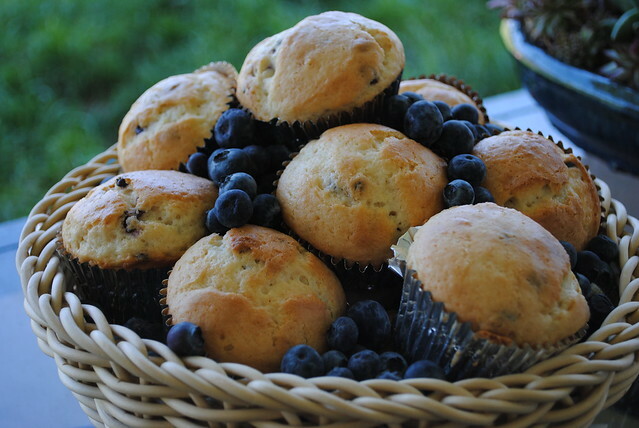 It is also easy to dress up with fresh blueberries- just drop them into the muffin cups and they go from good to amazing! We have been doing a lot of traveling this summer, visiting grandparents and spending time at our cabin. The funny thing about the cabin is that it is so remotely located that if you get caught up there in a rain storm, you can’t leave. My husband’s cousin spent three days up there once before finally sliding down the mountain roads (dangerous) and leaving huge ruts in the road (destructive and expensive to fix!). While some food is always kept up a the cabin, it would quickly get to be slim pickin’s with a family my size. So I brought up two Augason Farms mixes- one for Almond Poppy Seed Muffins and one for Scrambled Eggs. I chose these two items because almost everybody likes these two foods, and both mixes were very simple to make and only required water. There aren’t a lot of stores up at the top of an almost uninhabited mountain, so running out for that extra ingredient is not an option. I added these to the mountain cupboards with a note written in sharpie across the top “For Emergency Only- Only Eat This If You Cannot Get Off The Mountain”. Just having those two cans there would be enough for two or three good meals if we were to get stranded in a storm. Also handy for traveling are the snack items! 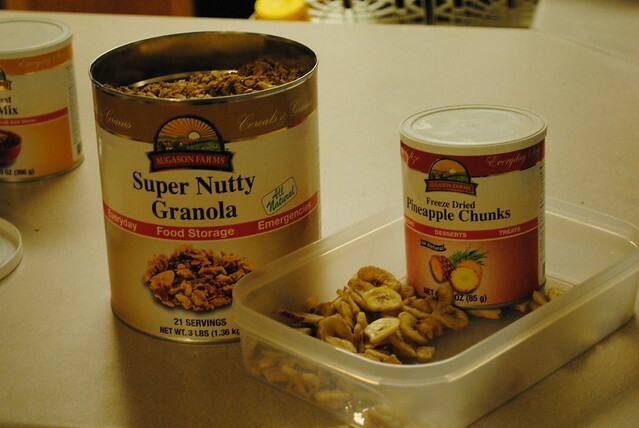 I can put together great, inexpensive road treats for my kids just by cracking open granola, banana slices and freeze fried pineapple chunks. Any of the fruits would be tasty, but we are fond of the pineapple. This picture is a little dark because I was packing these treats at ten o’clock at night the day before we left town. That is the beauty of food storage! It can be ten o’clock at night when you realize you need something NOW and it is already there. My last super fast meal idea for you is Chili Cheese Dogs. I love these, as do my children. I’m vacationing at my in-laws and since it is nice for me to cook at least a few of the meals while we are here, I brought an every day sized can of the Augason Farms Southwest Chili Mix. This is really good stuff. It also comes in a number 10 can, great for if you are cooking for a large group. (Think family reunion). I love making chili from scratch, but that takes forever. This sets up in fifteen minutes, and is a major crowd pleaser. It also makes me look like I worked harder than I did. 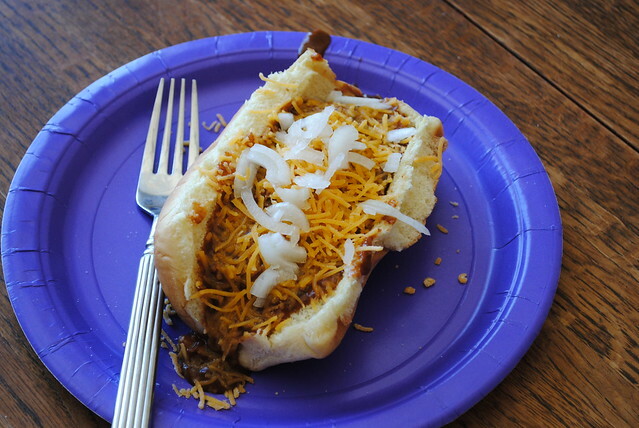 I slather the hot dog in chili and garnish with shredded cheese and chopped onions. SO good. It also cleans up in seconds since it is all in one can and one pot. In fact, it cleans up so quickly that before i was done serving dinner yesterday, my mother in-law had already cleared away my can, so it isn’t in the picture. You’ll have to check it out with the above links instead. This edition of Cookin’ With Augason Farms brought to you by one seriously lazy summer cook- because finger lickin’ food shouldn’t take all day! Go check out their 40th Anniversary Celebration and give yourself a break this summer! 3 Comments on The Lazy Chef: Laid Back Cooking For Hot Summer Days! Treats To Try With Augason Farms! I have a few new recipes for you to try out using your Augason Farm’s products! 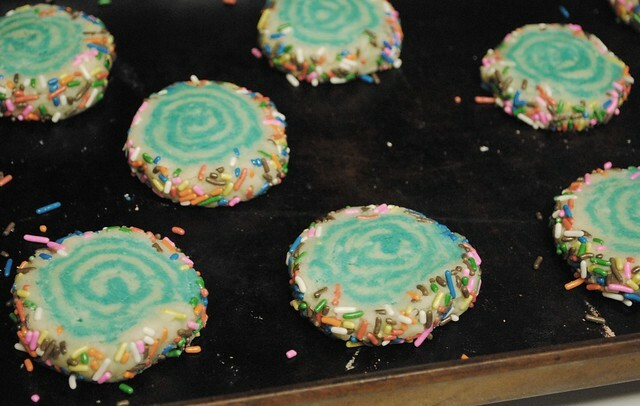 These swirl cookies were a huge hit at my house, and not too tricky to make. 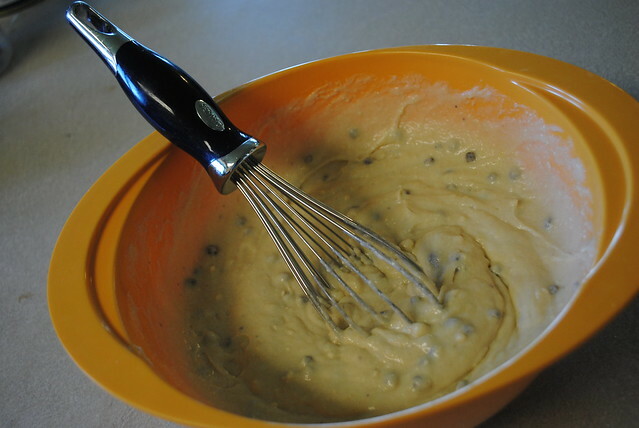 Start by mixing the cookie mix to the specifications listed on the package, then add in a cup of flour. If your dough is still super sticky, add more flour until you have a firmer consistency. Divide your dough. 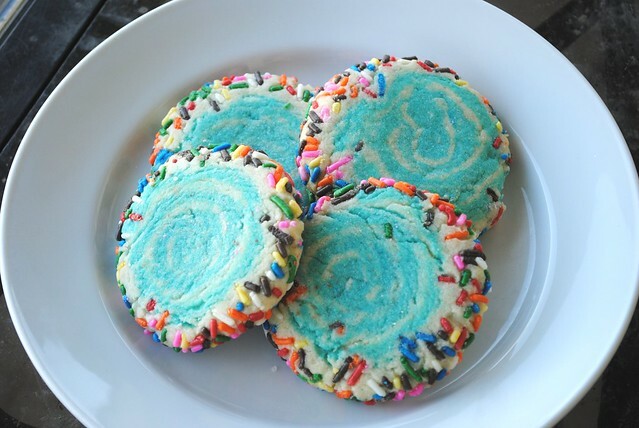 Roll half the dough out as if you were making cut out cookies. Try to keep the shape as uniform as possible, so it is easier to work with later. I did a rectangle. Take the remaining dough, add a few drops of food coloring (your choice-pink is pretty cute too), and mix it until the dough is uniform in color. 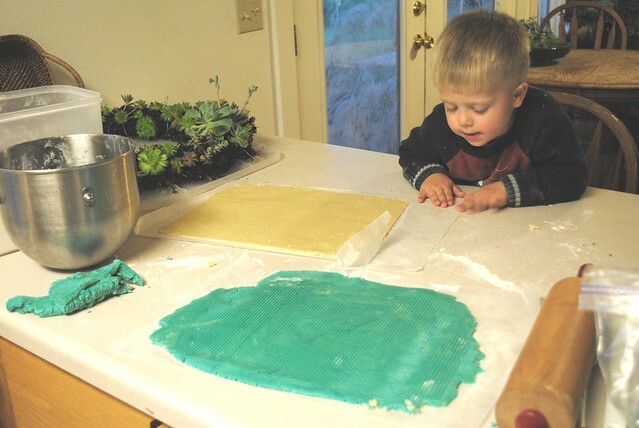 Then roll it out on wax paper so the shape and size are as close to the other dough as possible. 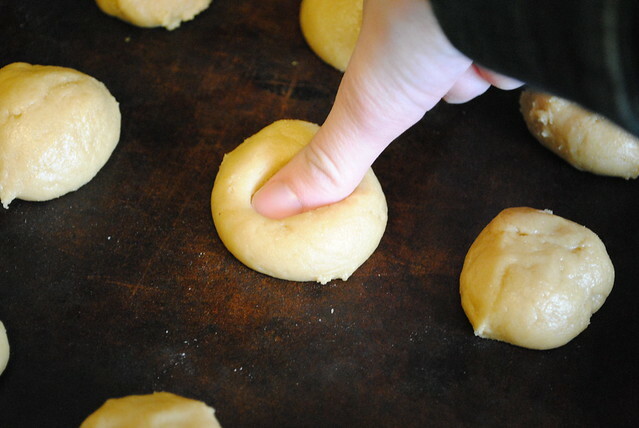 Flip the dough off the wax paper on top of the other dough, then go over it one more time to seal the two dough together seamlessly. Trim off any excess or irregularities. Roll the dough up as though you were making cinnamon rolls. 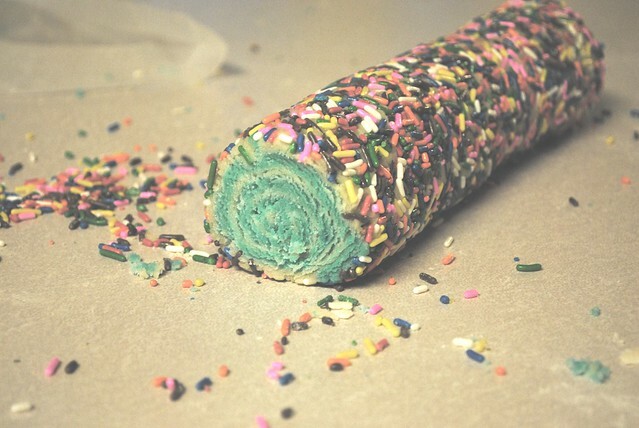 Put lots of sprinkles on a cookie sheet and roll your dough log in them until the sides are covered. Take dental floss, hold one end in each hand, slide it under the dough and cross the ends over the top to slice through the dough. You can use a knife, but floss works better. Lay your cookies out on a baking sheet. I pressed each of mine down on the pan to help any roughness from the slicing smooth out, and also so the cookies didn’t start out too thick. Bake them for 8-10 minutes at 350 degrees, and enjoy! 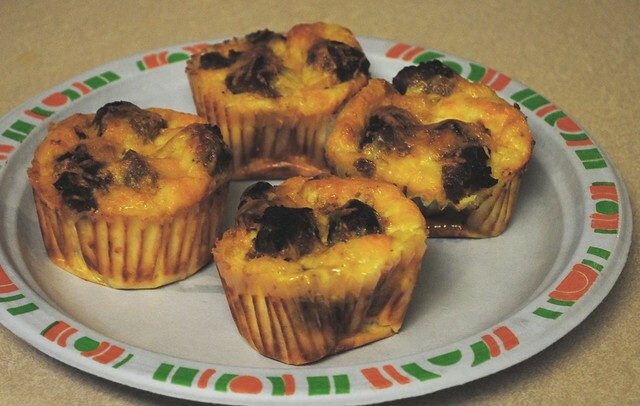 My next recipe is for Breakfast Muffins. These are a great goodie to serve at brunch, and easy to transport if you need to take them somewhere. It is also very easy to change the serving sizes- just add more of the ingredients- you can’t wreck it. 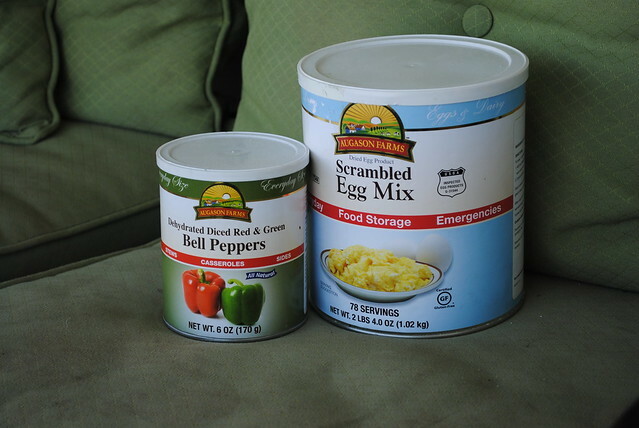 Augason Farm’s Scrambled Egg Mix prepared for as many people as you hope to serve. Get all of your ingredients prepped. Mix everything but the bread together in a big bowl. Line your muffin pan with cupcake wrappers. The foil type works better than the paper, but either will work. Fill the bottom of each muffin wrapper with bread cubes- about 5 for each one. 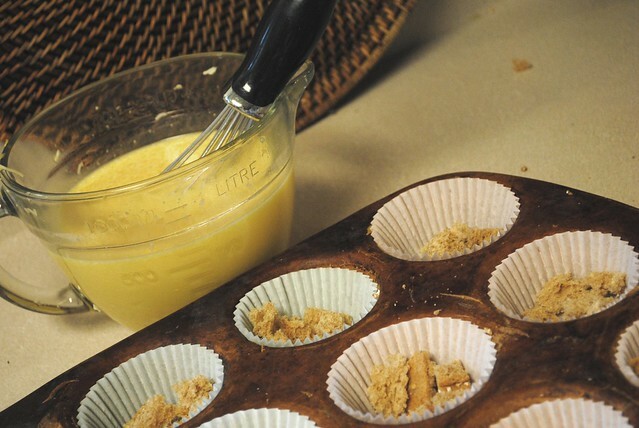 Then pour the egg mixture into the muffin wrappers until it is about 1/2 inch to the top. 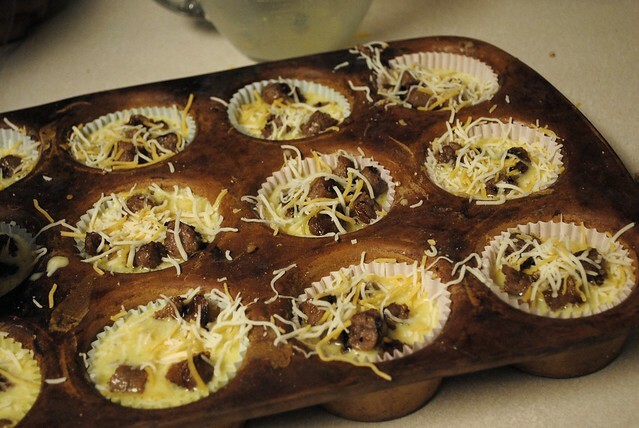 Bake these at 350 for about 30 minutes, or until the egg mixture is fully set. Depending on how much cheese you use, it make take more or less time. We like it cheesy, so it takes a little longer. When they are done, pop them out of the pan and serve. With kids getting out of school and busy summer schedules, no one really wants to heat up their kitchen cooking major meals. 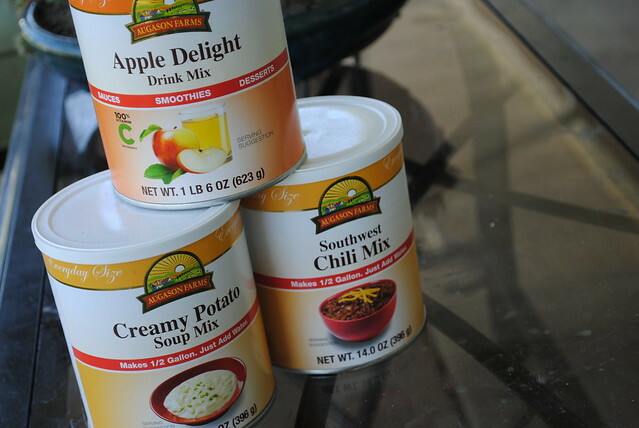 Augason Farms has a variety of great drinks to keep you hydrated and easy, every day sized soup mixes. Try the Southwest Chili Mix over your next grilled hot dog for a perfect Chili Cheese Dog- without the work that chili from scratch requires! Mix all of the ingredients together and put in a greased, microwave safe cake pan (I like to use a stoneware bundt pan for this one). If you don’t mind heating up your kitchen, then cook it according to the directions on the cake mix. If you want to use your microwave, put the pan in the microwave and cook on high for 12-18 minutes. I am giving a wide range here because microwaves often cook at different speeds. Our last unit took 13 minutes, our new one takes 16. Basically, keep an eye on it after 12 minutes and when a knife comes out clean, your cake is ready. Allow the cake to cool, then drizzle chocolate frosting over the top and serve! Comment on Treats To Try With Augason Farms! Winners have been announced! Check it out at the Nook Blog! Welcome to the Nook bloghop! I’m the last blog in the line-up, so I’m going to keep my post short and sweet, and down to brass tacks. Today we’re giving away $150 worth of new scrapbooking goodies- paper, flowers, thickers, stickers, ribbon and more -OH YES-MORE! These will come from a variety of beautiful companies like Petaloo and American Crafts and Cosmo Cricket and My Mind’s Eye and Crate Paper. Many items will be hot off the presses from the latest CHA and many will be perennial favorites and classic embellishments. Interested? Want an entry? It’s simple. Anyone can enter. Drop me a comment down there in the comment box. Feel like two entries might be more helpful? Click that like button at the bottom of this post and share it on facebook, or link to it from your blog and leave me another comment. And if I happen to be the first blog you’ve stopped by that’s talking about this hop- well, the beginning can be found at the Nook Blog, and there are FIVE other prizes hidden along the list of blogs you will find there! 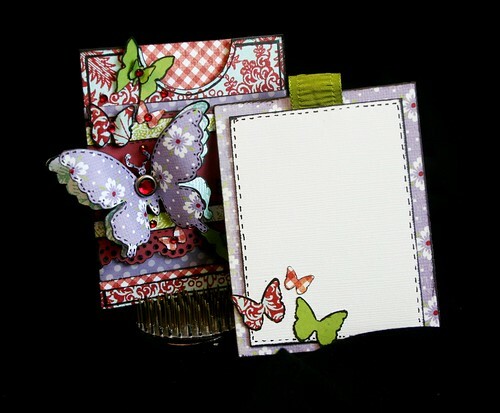 If you love to scrapbook, you will love checking out the talent on these blogs. 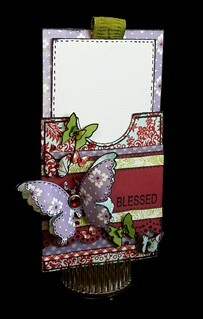 And if you love to scrap- then you will also love the beautiful kits I put together for My Scrapbook Nook kits! Go check them out, and send yourself a little present every month with a subscription. We have just a few March kits left (featured above). Anyone who joins now will get a grab bag that coordinates with the upcoming April kit (featuring Story Teller by Crate-pictures coming very soon! )- and that grab bag is worth $55! Grab bags are also available for our subscribers every month at a dramatically discounted rate. This one is going for $10- but they are very limited, and sell out quickly! If you think you might want a place on the Nook’s design team- then be sure to check out this post on the message board for more information on our up-coming DT call! 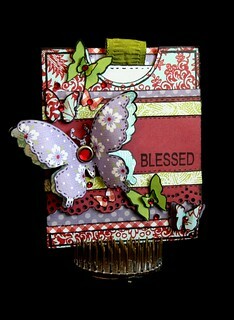 This card was made with a past kit from the Nook- one of my old favorites being shared again, since I haven’t done anything too creative lately. Hope you like it! This bloghop starts Friday morning and closes on Wednesday evening, so hurry quick and get your entries in! 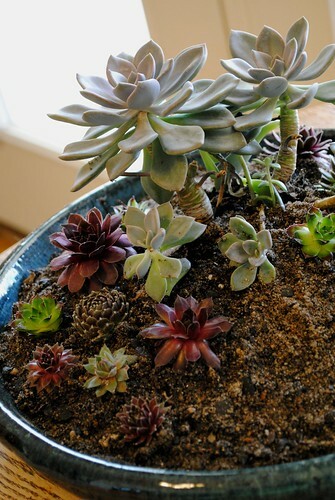 Do You Love Succulents? I Do! Today I am going to introduce you to Young’s in Roseburg, Oregon. 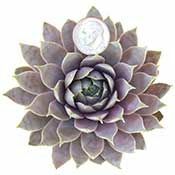 While they have a lovely, family run brick and mortor nursery, they also have the very best online site for succulents I have ever found. 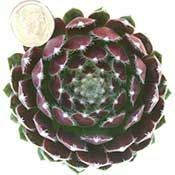 They specialize in Hen & Chicks or Sempervivum, which just so happen to be one of my most favorite plants. 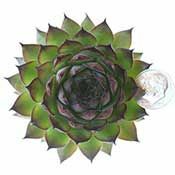 Sempervivum is Latin for always living. They are aptly named. Not only are they quite difficult to kill (being a perennial in most zones), but they send out little runners and grow baby plants that grow around the big mama plant. This big hen surrounded by her chickens is how they got their nickname. Because there are always more babies to replace plants that have past maturity, the same plant seems to live on forever and ever. Young’s has the best online selection for these, as well as the best prices and shipping that I’ve found. 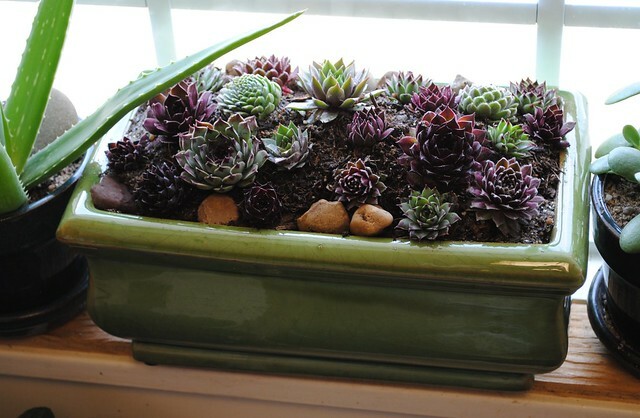 If you like Sempervivums- you just hit pay dirt. The ones above are a few of my favorite varieties (you can click them to learn more). 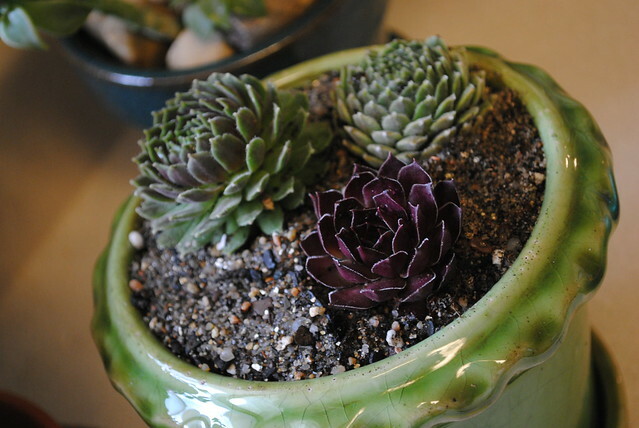 The first one pictured is actually a type of Echeveria, a succulent that looks a lot like a Semp. 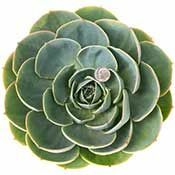 They are both hardy, drought resistant, deer resistant plants- the biggest difference is that Echeveria doesn’t tolerate cold well and should be treated either as an annual or as a friend you bring inside for the winter. When we lived in California I had planters full of this particular variety all over my patio and they were just the most beautiful things. These all ship very well, even in chillier temperatures. The orders I have placed have all been in the deepest part of winter 2012. I also used to send my mom babies from my Echeveria plants and they handled the trip just fine, arriving in North Dakota and growing to the size of spectacular dinner plates! The color isn’t great in the photo above, since I shot this picture at night- the Sir William Lawrence Semp is one of my very most favorite! You can plant them in just about anything. They will grow in a pot, in rocks, in sphagnum moss, in hanging baskets, in the cracks in your driveway! If you are a chronic plant killer, you will meet your match in these. They like to live! They come in a big variety of sizes and colors, so you can tailor to your unique tastes. When I looked today, there were eighty-two different flavors online. They do come in and out of stock, and new varieties are added frequently! 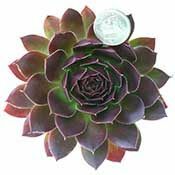 They have great prices too; they send three of each Semp (a small, medium and large) and almost all varieties are $3.00. That’s right- $1 each. 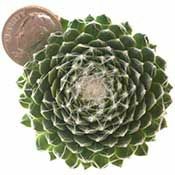 Additionally, they have a flat rate $6.95 shipping AND they throw in a free set of three surprise Hen and Chicks with each order! The last ones I got free were GORGEOUS! THESE ARE AN AWESOME DEAL! And- if you want to feel really good about yourself for buying these, not only are you supporting a family business, but it just so happens that the Semp section of the shop was started to put kid through college at BYU. That’s what family businesses are all about, after all: FAMILY! These guys are very simple to plant. 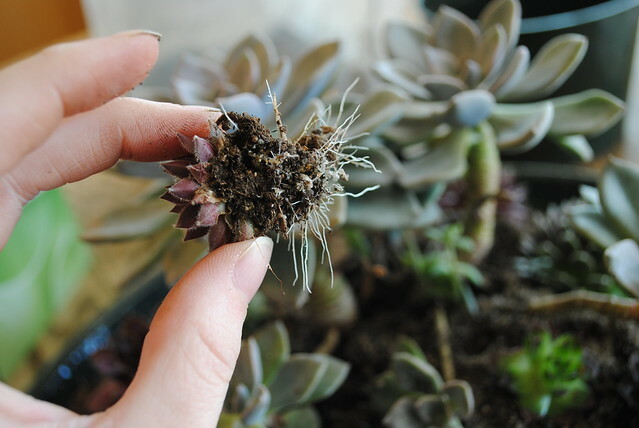 My super secret method is to poke a hole in the dirt (use your favorite cactus mix if you have one; but they manage well in all types of dirt) and stick the plant in it. Then I water it. I know, this is complicated stuff, eh? This is just one of the many reasons I love these. While they are able to do well with neglect and sporadic watering, newly planted ones will do much better if they are watered more regularly. They also like light, so pick a bright spot. I just got this pretty glazed, shallow planter today and I am partway finished with it. 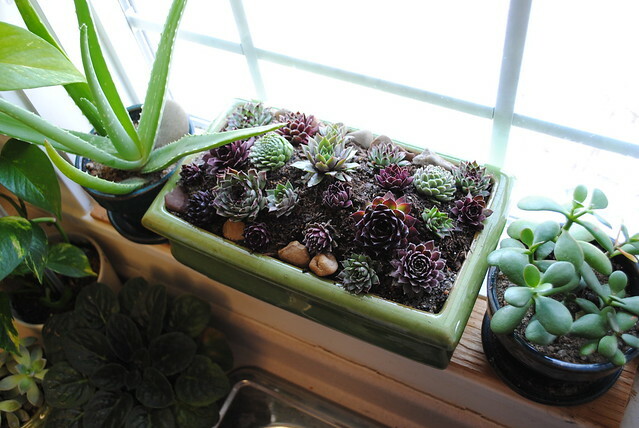 The larger plants are either Aeoniums or Echeveria, I’m not sure, and the smaller are a variety of Sempervivums. I plan to fill in the rest with Sedum (Young’s has some really unique and fun sedums) and some of the smaller, fuzzy semps when my next order comes in. I can’t wait to see what it looks like in a few weeks when it has filled in! Many of the Semps I got from Young’s about a month ago are already sending out their own runners to make more babies for me to plant! 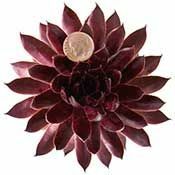 They are easy to take off and replant wherever you fancy, so when you buy a few semps, your collection can grow quickly! 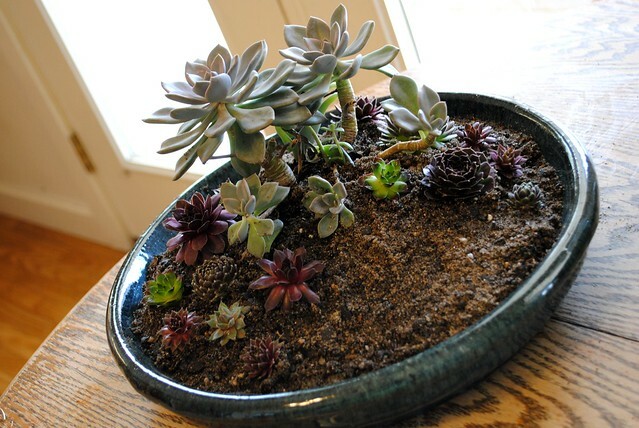 There are so many amazing ways to plant them that you will be thrilled to have lots of new, baby plants to be creative with! I hope to get to show off a few fun ideas over the next few months as things warm up and Spring arrives! For now, I am just satisfying my gardening itch with a few pretty indoor planters to green up my dining room! 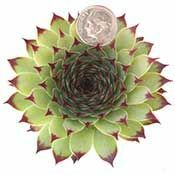 For more neat ideas, try out the Sempervivum Blog. And be sure to add a little beauty to your life and send yourself some succulents from Young’s. What are you waiting for? Go satisfy your craving for summer and let them know Leah sent you! 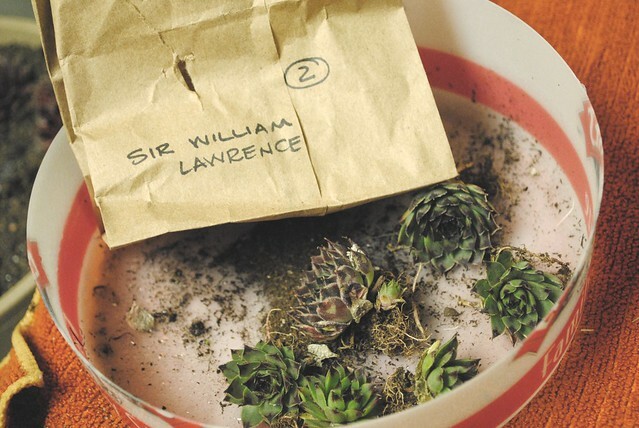 8 Comments on Do You Love Succulents? I Do! OK, it has been awhile since I worked on my scary, scary craft closet and attempted to corral all of the paper, pens, glue sticks, yarn, ribbons, scissors, stickers and dies into something manageable, and efficient, rather than one big wreck that looked alike someone lobbed a bomb into a Hobby Lobby. I was given the chance to try out a cool label maker to help me in this pursuit, and slowly, all my little bins and boxes and binders became perfectly uniform with classy little reminders of what was inside. What the real question behind the labeler is though, is did the labels stand up. We’ve all tried labels that peel off and get all sticky and goobery and then stick to everything they shouldn’t. This Brother P-Touch label maker totally trumps the other ones I’ve used as far as durability goes. My closet of chaos is still in reasonable order, and it has been very nice to go try to find a die I cataloged into one of my many binders and be able to grab it at a glance, rather than after an hour of searching where I gripe and cuss and completely lose my creative mojo. I’ve since used the labeler on some computer stuff, as well as my kids’ school materials. My pantry is finally organized enough that I’m considering branching out into there as well. For now, I’m just enjoying the fact that only I can identify the spices in my new spice rack- haha. I’ll be fixing that soon. It drove my parents a little crazy when they visited and tried to cook. Anyway- I give this labeler a good grade, and will definitely be using it in future projects. I have a whole garage to get organized this summer! Happy Valentine’s Day! I said I would announce the lucky winner of the Augason Farms Emergency bucket today, so cue the trumpets, and blow the fanfare for Nina C! I would love to have some small food storage while we are stuck in our condo! That bucket would be like three day food kit in a very small space! Here’s hoping! Thank you to all who entered. I hope you will go take advantage of the last day of the Valentine’s Day Sale over at Augason Farms and stock your pantry with some great food! Comment on An Augason Farms Winner! I was offered a chance to review the newest additions to the classic Johnson’s Baby line- a whole new array of products focused on using more natural ingredients. They want to promote simple changes in how we use the resources the world has given, because these simple changes add up to a big difference. Since they are a company focusing primarily on the world’s newest inhabitants, it is so fitting and sensible that they would want to lead the way in keeping this world lovely and our resources available for these babies! I admit, I am always a bit hesitant to use “all natural” products. They are either a huge success of a huge flop with me because I am seriously allergic to so many natural elements (grass, dirt, mold, pollen, most pretty flower scents). . .as you may imagine- it is always a leap of faith to grab something out of the ordinary for my skin or for my kids’ skin! We all get sneezy and rashy in a hurry, and I can make myself sick just putting the wrong soap or lotion on one of my babies! We tested out the new shampoo and lotion and I was pleased with both! They are pleasantly, super mildly scented, and sensitive enough for my skin. If you want to take a baby step toward a more natural lifestyle, check these new Johnson’s Natural products right here. And kudos to another company taking steps in the right direction! I must start out by saying, my kids are poops when it comes to brushing their teeth. In fact, it is almost the only thing they will actually lie about to my face. “Did you brush? Did you use toothpaste? Did you rinse? Really? Really? Let me see. Let me smell.” These are things only a mother will say and do, and we are still doing this daily, even while on the challenge. That being said, we are doing alright. I have one kid who has a sparkly smile and seems pretty gung-ho into it all. She’s a peach. I have one who is still trying to get out of it just as desperately as he did when he was a toddler. And now I have this blog post as proof that this was not my fault when he needs root canals and crowns as an adult. I tried, kid. I really did try. My youngest is still the tooth brushing king, and we have actually hide to hide the rinse because he would go through a bottle in a day with his enthusiasm for minty fresh oral care. This one will be a dentist, and his big bro better start sucking up so he can get a discount on all the negligence-induced dental reconstructions he will need as an adult. My best ally here really is the cute characters on the Listerine rinse. They all get excited about that part of the process. Character toothbrushes help, but since my youngest like to steal toothbrushes and hide them, we replace brushes quite frequently and they are already on to whatever I had laying in the bottom of my toothbrush/paste drawer in the bathroom. This irritates me to no end, since I spend at least $15 a month on replacement toothbrushes, but I am trying to look on the bright side and credit this toothbrush kleptomaniac with reducing the spread of viruses by keeping us really on top of getting new brushes. I am trying hard to see the potential good in all inconveniences. Since I can’t find any good in a root canal, I am keeping on top of this oral care challenge for me and the kids- that way I don’t have to think up anything positive to go along with hours of pain and the gag-nasty process of getting a crown. Overall, I think this has really helped at least one of my three get on board with better oral care. The oldest could still use some motivation, but has been a little more positive about things. My youngest, well, he’s still just as excited about his teeth as he was in the beginning. And he has really good breath. 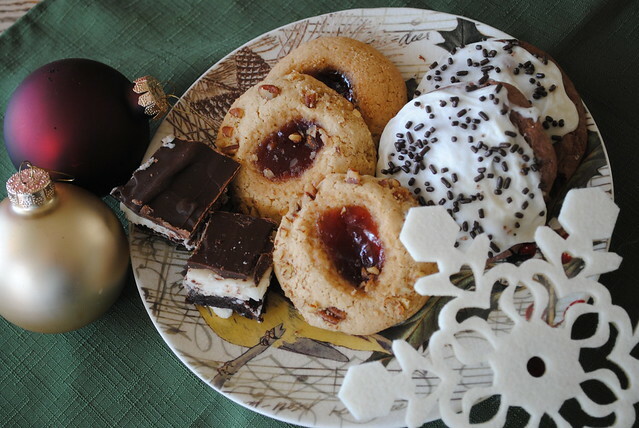 It is Christmas baking time here at my house, and the goodies just keep coming! 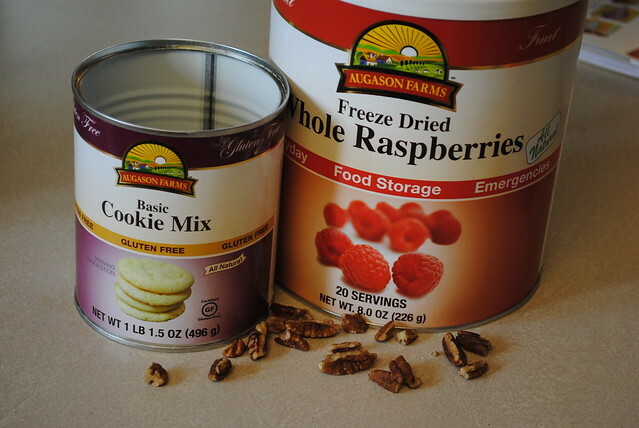 I decided to learn how to better use some of my Augason Farm’s food storage to help with the holidays. Sometimes people look at a food storage list and can’t fathom why there would be cookie mix and brownies and hot cocoa. These, while not nutritionally sound, are actually important parts of a food storage because of the psychological benefits that are had by having access to comfort foods during times of turmoil. Everything might be falling apart around you, but eating a brownie usually makes a person feel like she can carry on. It is also important to keep these items on hand to help you celebrate birthdays and holidays with a feeling of normalcy. This isn’t just me talking- there is actual scientific proof behind that! So, without further ado, bring on the sweeties! Today we have thumbprint cookies, brownie mix cookies and mint brownies! 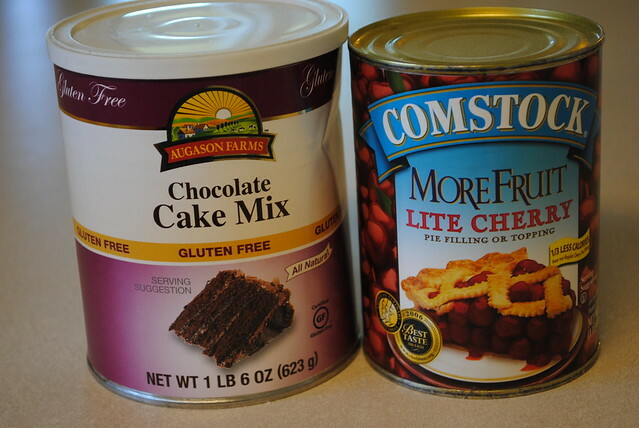 The base of each of these recipes is an Augason Farms mix, either the gluten free cookie mix (yum!) 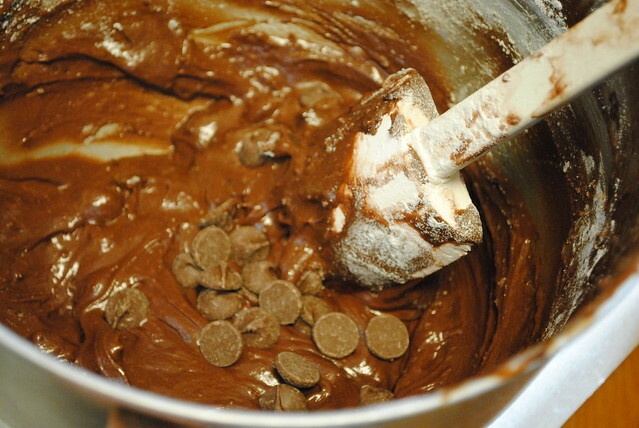 or the fudge brownie mix (also, yum). Combine all ingredients. Bake until just set at 350 degrees about 9-10 minutes. Let cool and then ice with your favorite icing. Sprinkles are a MUST! 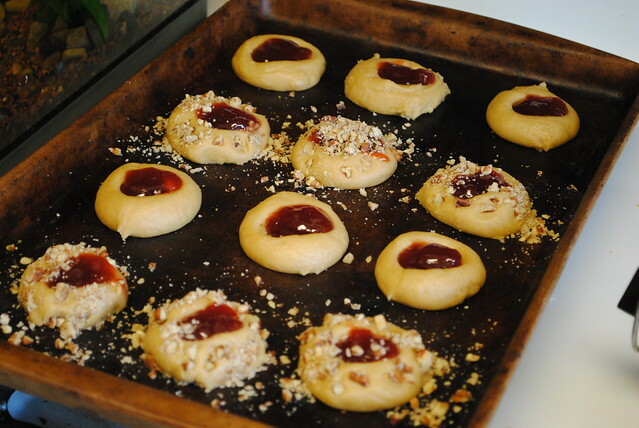 These are usually called raspberry thumbprint cookies or apricot or strawberry. The thing is, you can use any type of jam or fruit you have on hand. Augason Farms fruit of your choice plus 1 cup sugar. Mix up your cookie mix per directions on the can, add the flour and extract, then roll into balls. They should be sticky, but not gloopy. If you need to add a bit more flour based on altitude, go ahead. Once your balls are made, lay them on a cookie sheet and firmly press your thumb into the center of each cookie. Here is the tricky part. If you have jam, you can scoop it into the indentations you have made. If you have fruit and sugar, boil it down in a pot, stirring continually until it is runny. I use a table spoon to scoop the mixture into the prints. Hint: even if you are using pre-made jam, heating it up so it is runny makes it ten times easier to put it into the thumbprints. I love these with chopped pecans, my kids don’t. So I make a few of both. Sometimes you feel like a nut. Sometimes you don’t. You can have it both ways with these. These need to bake at 350 degrees for approximately 10 minutes or until a light golden brown. Prep brownie mix and bake as directed on your package. green food coloring optional (I opt out because I don’t think we need any more food coloring than we are already ingesting, but that’s just me being a killjoy). Frost the brownies with this layer and let it set for about a half an hour. Melt these ingredients in a double boiler and pour over the top. You can drizzle or make a complete chocolatey layer. I do both. If you are loathe to double boil, you may also skip the butter and chop the chocolate as fine as you are able and just put it right on the top. All three ways are excellent- we are talking about chocolate here. Now you are ready to take a beautiful basket of treats to your friends and neighbors! Augason Farms is also a great Christmas gift option, and can provide security for college students, newlyweds, aging parents and families who need a jump start on stocking their pantries and becoming more secure. 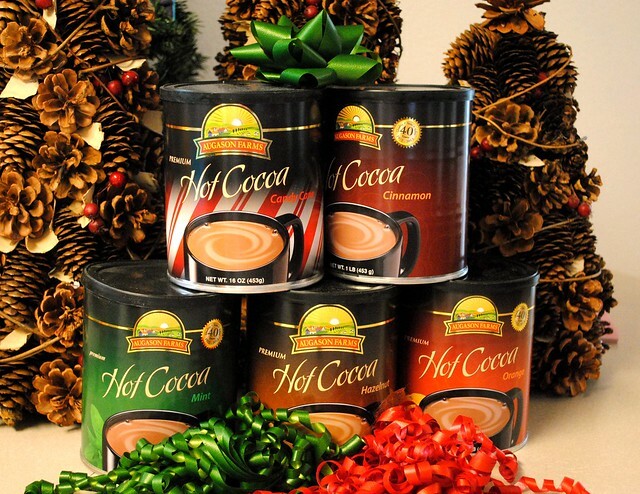 This year I am giving Augason Farms cocoa as well as some of their great kits and packs. Chris and I love trying out new cocoas and the large variety of flavors Augason farms offers is great! Chris fancies the hazelnut best, and I love the mint and the cinnamon. There are also orange, raspberry, candy can, marshmallow and plain varieties. Snag yourself a few to keep you warm this winter and a few more to keep that pantry stocked! Merry Christmas and Happy Baking to all!